Install a hypervisor on the node and attach the Controller VM ISO to the system. Where can I get the Controller VM ISO from please? I went to the Downloads section of the portal (https://portal.nutanix.com) but couldn't find anything relevant. it-nugget no worries, have you ask Nutanix support ? The Control VM ISO is also called Phoenix, that is only needed in case you are doing a bare metal installation when the nodes have nothing installed. A fresh Nuatnix box will always arrive with AHV and CVM already setup, so you need to used foundation applet to configure the cluster or re-image to the hypervisor of your choice. Go through the field guide 3.7 available on the portal. only to notice that the list is empty; refer to the screenshot provided below. I really hope I am not offending anyone from the people out there trying to help (your assistance is greatly appreciated, honestly), but this is by far the worst company technical documentation I have ever encountered. Can you share some information, are these new blocks, what hypervisor r u planning to install and what action had been taken so far.. based on that i can help you with exact procedure.. Thanks for your reply, please find below all the details. What I would like to do is decommission the entire cluster and rebuild everything from scratch (same as having a baremetal server shipped from Dell or HP without any kind of software installed), by deploying all prerequisite software individually so that I can understand how this environment works. 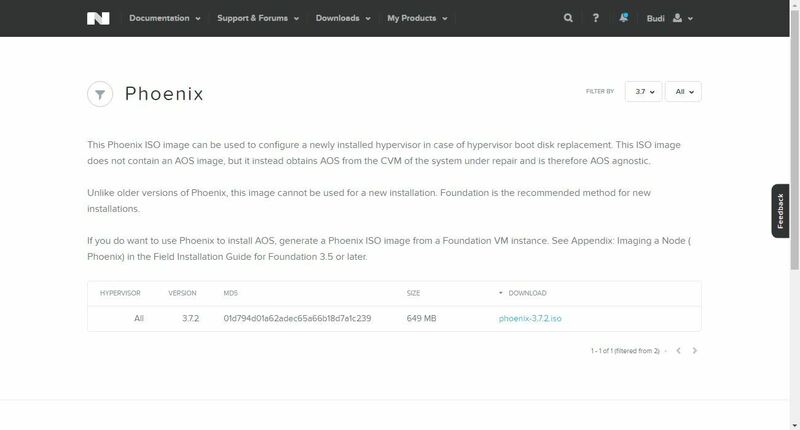 Having said that, I would greatly appreciate it if you could briefly explain how these components work together, for example, what is Foundation, what is Acropolis (is it the Nutanix platform providing these virtualized services) and what is Phoenix; as I understand AHV is the actual proprietary hypervisor provided from Nutanix and NCC is a just health check plugin provided through Prism where Prism is a service provided through the CVM. Don't really know what the problem might be, thanks for trying to help though. Yes, I have opened a few tickets for them to have a look. This is an update in regards to reinstalling the Nutanix cluster from scratch; in case anyone encounters the same issues. Apparently, for reimaging a cluster from scratch, you need to get in touch with Nutanix support, because the necessary installation files can only be provided from their side, unless of course you are listed in the portal as a partner. For ordinary customer accounts, you simply cannot reimage the cluster and start clean. I am now waiting for the designated account manager to get in touch so we can proceed. For what it's worth: yes this helped. I've been looking for this info for 2 days now. So thanks! And I agree the support documentation structure is pretty horrible. I expected better.